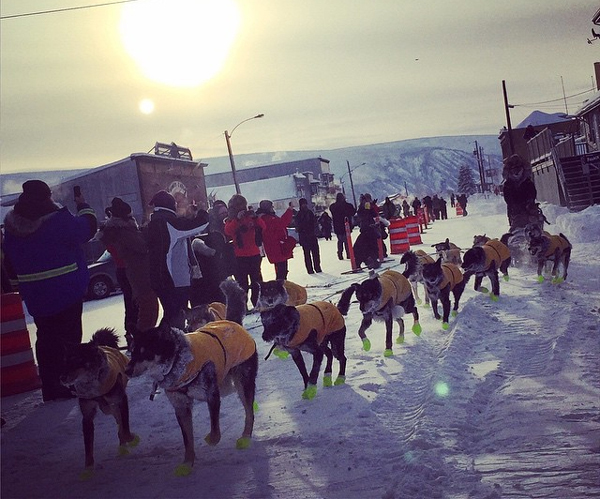 The first two Yukon Quest dog teams had smooth runs up and over American Summit and arrived safely in Eagle, the sixth checkpoint on the trail. In the process, Brent Sass gained time on rival Allen Moore, but there are still 400 miles of trail ahead and teams have to climb two more major summits. This is the first time since 2011 that the Yukon Quest trail has followed the traditional route over American Summit. That year, Sass arrived in the checkpoint to relay a story about a dramatic rescue involving four-time champion Hans Gatt. So, it was only fitting that Brent Sass had a yarn to spin when he arrived in Eagle, just after he descended the Summit. “I got charged by another moose…,” he said. Sass says he encountered a moose just as he came off the Forty Mile River to join the Taylor Highway. “It literally just kept walking at us and I couldn’t do anything because if I would have taken my foot off the hooks, the dog team would have run right at it, so I was sort of crippled holding the dogs back,” Sass said. The encounter is similar to one Sass had last year near Pelly Crossing Sass. He says this year, the moose kicked at his team. Perhaps worse than a run-in with an angry moose is Sass’s anxiety about the team behind him. “Every second that I go down the trail, I think that Allen’s going to catch me,” Sass said. Sass left Dawson City six hours ahead of Allen Moore. “There was like a time when he hadn’t even left Dawson yet and I was still looking over my shoulder, I was still looking down the trail going ‘ok, when’s his headlamp going to come?’ It’s not even mathematically possible!” he said. Sass may not know exactly where his competition is on the trail, but there is one thing he is very sure of. “It’s totally my race to lose at this point,” he said. Teams have to take a mandatory six-hour layover in Eagle before the head back out on the trail toward Circle. Sass left the checkpoint before Allen Moore even arrived, so he never got a look at the team ahead. “His lead is substantial, but a lot of things can happen,” he said. Moore decided to break up the 150 miles between Dawson and Eagle into three runs. Sass only did it in two. “We had this plan made before the race. We just thought it would better hopefully that they would have a lot of energy and the end of the race,” he said. Early on, Allen Moore says he intentional slowed his team. He also added an extra six hours of rest before they arrived in Dawson, because of a rule change that decreased the mandatory layover there by 12 hours. Moore’s strategy is risky. He’s hoping extra rest will turn into the kind of speed his team can use to catch Brent Sass. And, says Moore, there’s still Eagle Summit. The second of three major summits on the Alaska side of the trail is still roughly 250 miles away. Previous articleHow Could Potential Military Drawdowns Impact Alaska’s Economy?